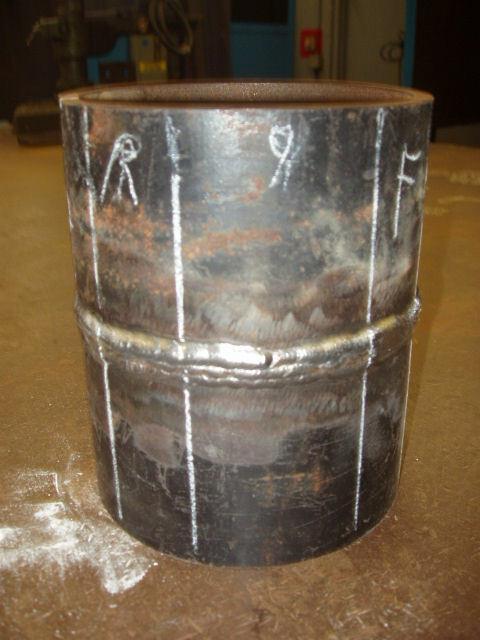 This is the final part of how to pass a 6G pipe welding certification. 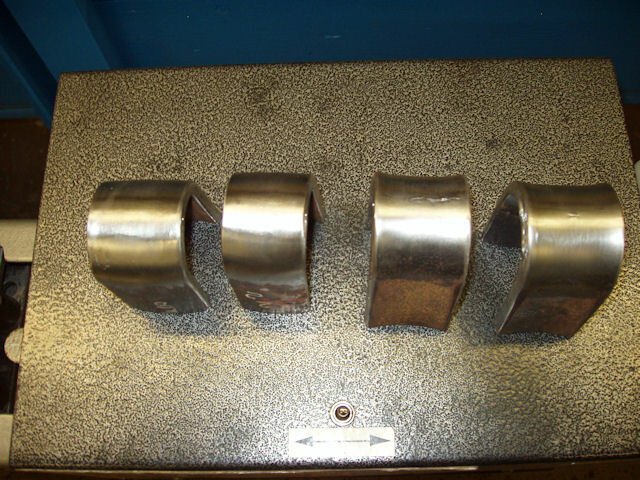 This page covers the destructive bent test required to become a certified welder. This section covers how to mark a pipe for bend test coupons, cutting of weld coupons and a bent test conducted by a Certified Welding Inspector. Finally passing the AWS B2.1 6G pipe welding certification. At the bottom of this page there is a list of links to all of the related content ranging from the root pass to the bend test. 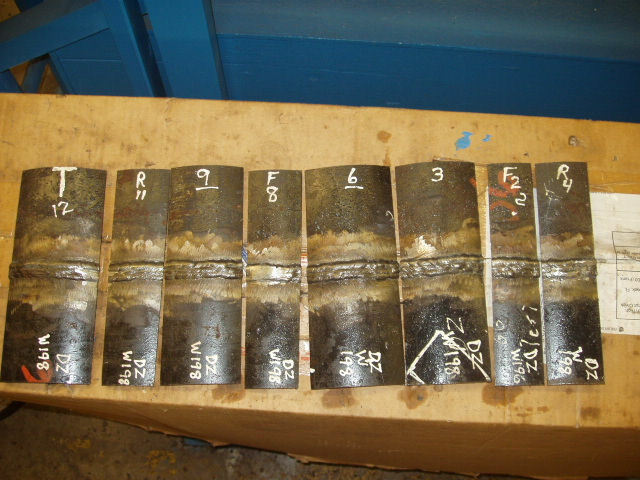 Preparing of the test coupons was done following the AWS B2.1 welding certification procedure notes. First I marked the pipe with a template. 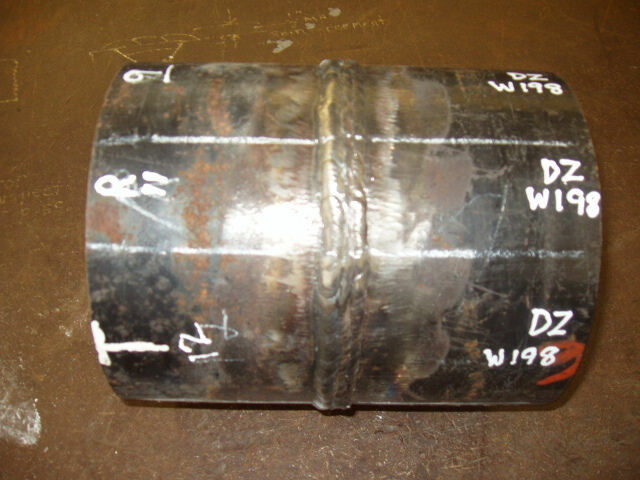 The template marks the pipe from the 1 o’clock to 12 o’clock positions. Next lines are made to cut out 4 coupons. The coupons need to be a minimum of 1/ ½ inches wide otherwise they will be rejected. There will be two root bends and two face bends. The root bends were at the 11 o’clock and 4 o’clock positions. The face bends were on the 2 o’clock and 8 o’clock positions. Template for marking pipe coupons for bend test. 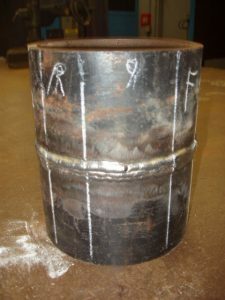 Weld coupon specimens are marked on the pipe with soapstone. 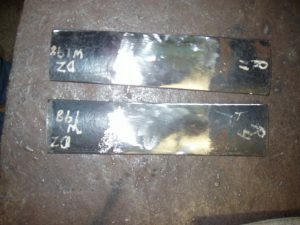 Now the Certified Welding Inspector put my initials on the specimens and the weld procedure number that is maked in his records. 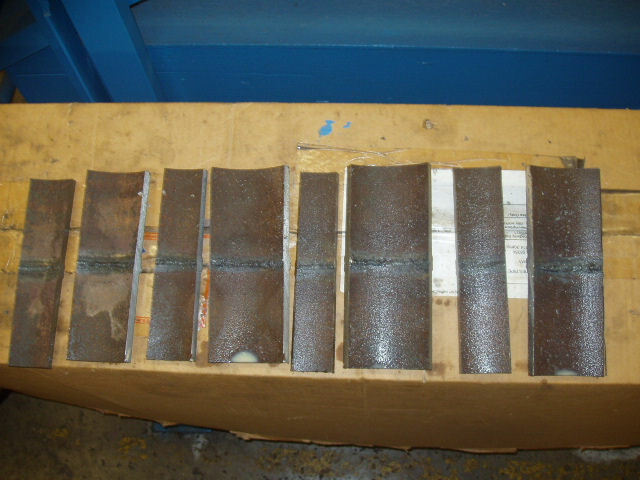 The coupons are then cut on a horizontal band saw. 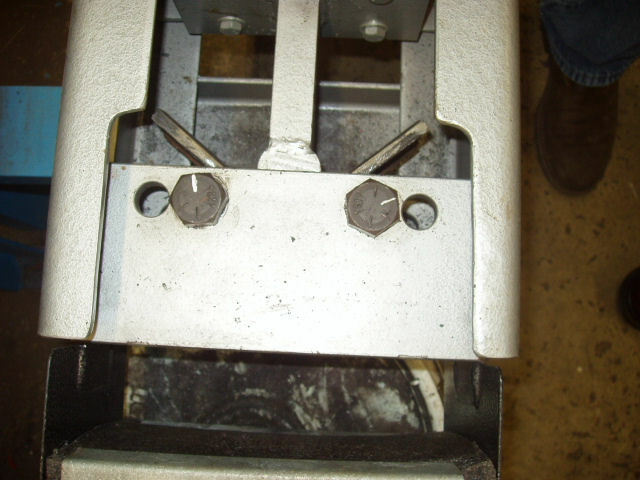 Some of the coupons did not come out even because the band saws vice had a worn out part that needed to be replaced. But again the coupons were a minimum of 1 ½ inches wide so they were accepted. 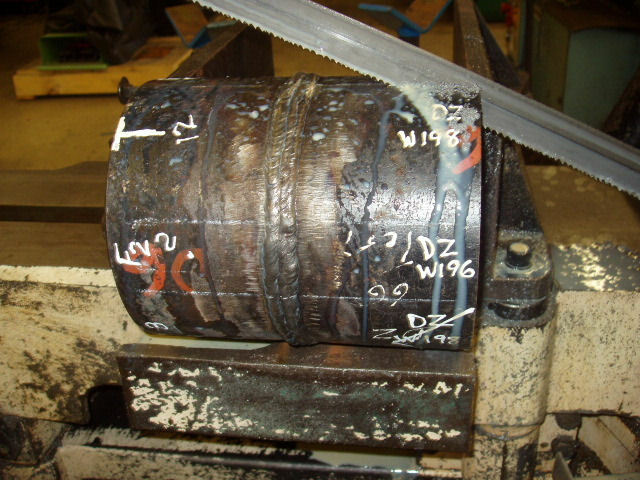 The first cut of the pipe coupons on the bandsaw. 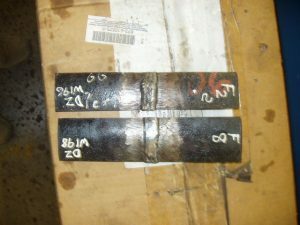 Here is the pipe with a few coupons taken out of it. The pipe was rotated and coupons are being cut on the other side now. Now the pipe is cut into bendable sections. The sections are two root bends, two face bends, and the larger pieces are the alternate coupons. 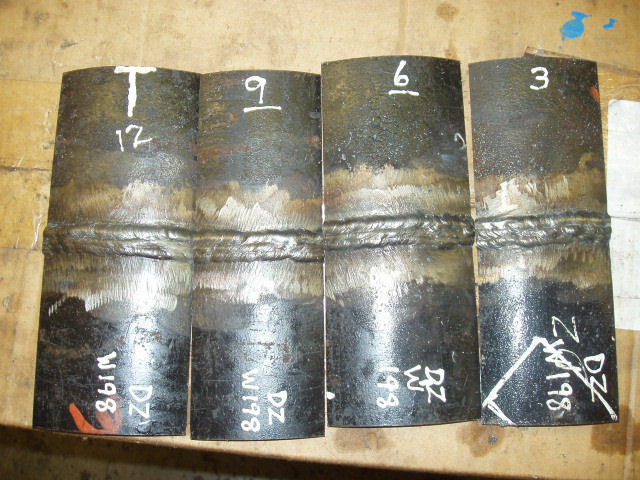 All of them are marked to identify the proper sections of the pipe. 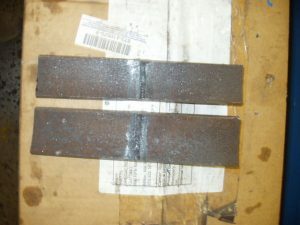 R stands for root, and F stands for face, and the number refers to the position that the coupon was welded in. 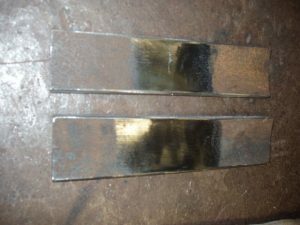 The pictures below are showing the root of the weld and the cap of the weld. 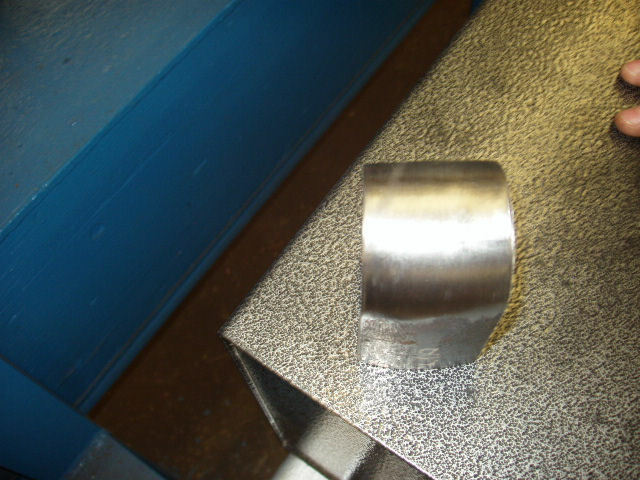 This is the inside of the pipe cut into coupons before grinding the root flush with the base metal. 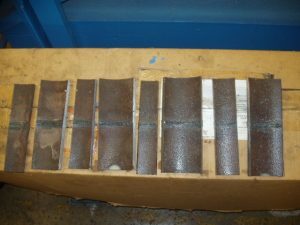 Here is the same weld test coupons flipped over to show the cap weld or the face of the weld. Once you have the test coupons they need the center of the weld to be marked with a center punch. 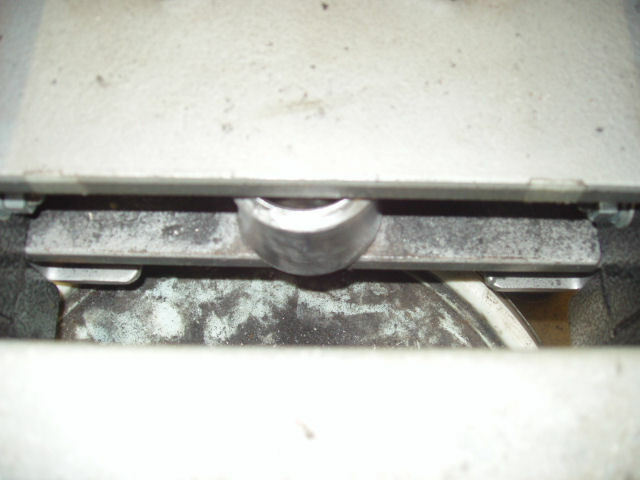 This is done to make sure the weld area is being bent. 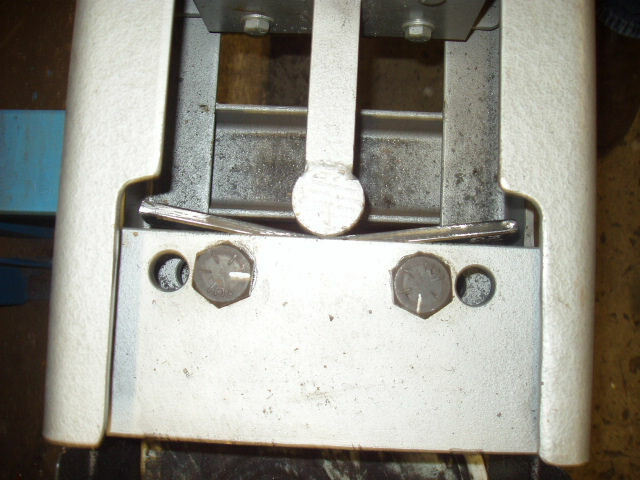 I put the test coupons in a vise to hold them before marking them so they would not move. 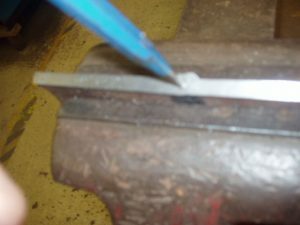 Once the test coupons were licked into the vice I used a punch and hammer to mark a dot in the center of the weld area so the center does not get lost during grinding. Finally the cap and root of the weld need to be ground. 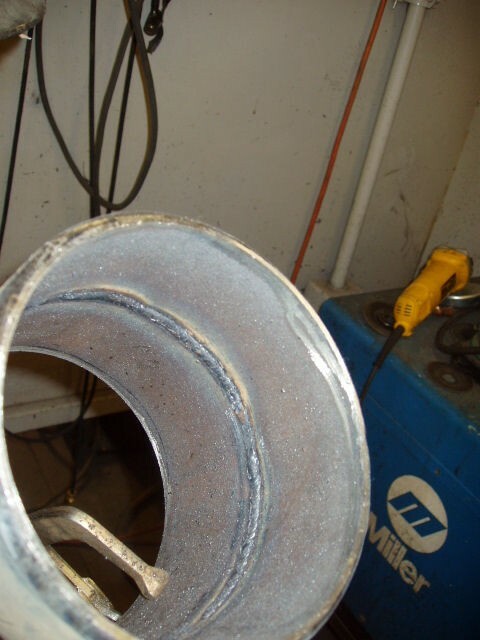 When grinding down the weld reinforcement you are not allowed to go below the surface metal. On my root I had some concavity. This must be left alone. 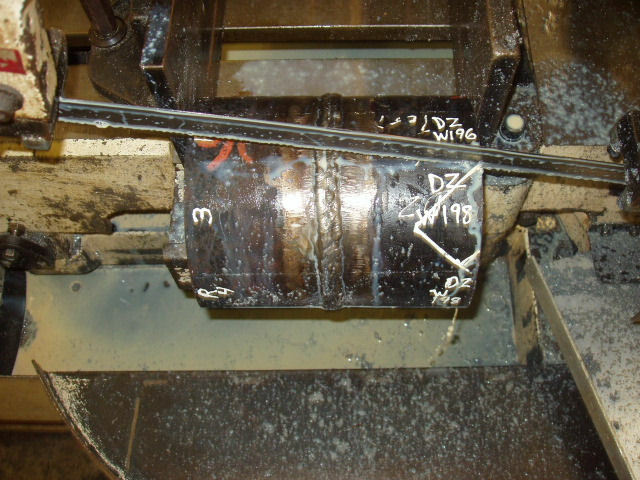 At first I thought undercut and concavity will cause the test coupon to fail. That is very far from the truth. 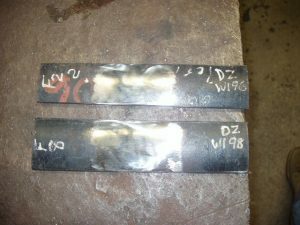 So if you are taking a welding certification and have some undercut, don’t worry about it as long as your weld is solid! 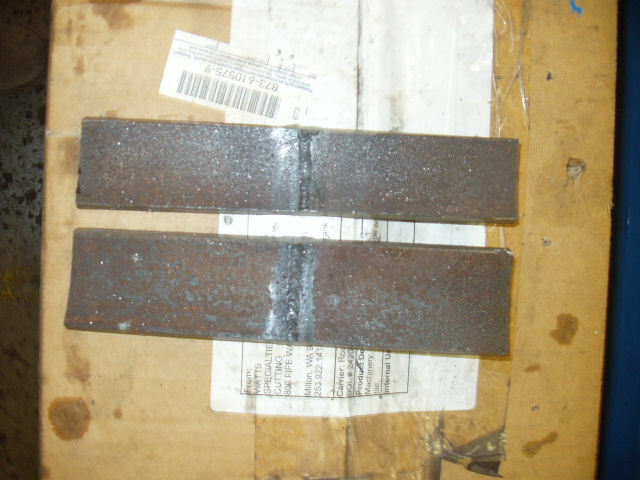 The pictures below are before removing any weld reinforcement. 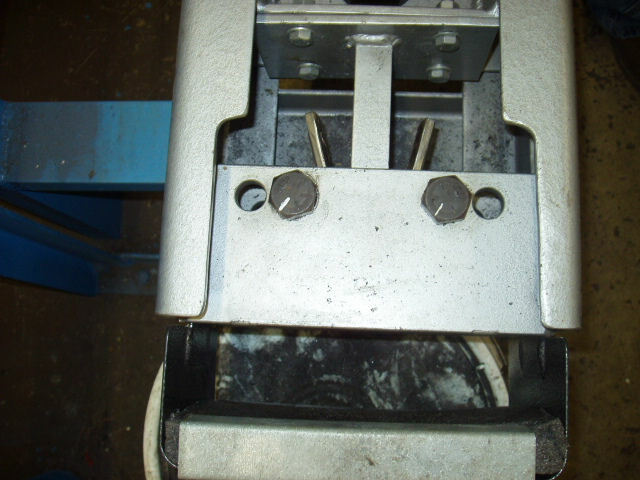 Face bend coupons before grinding excessive reinforcement. Looking at the weld cap. 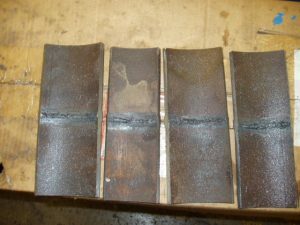 Face bend coupons looking at the root weld side. 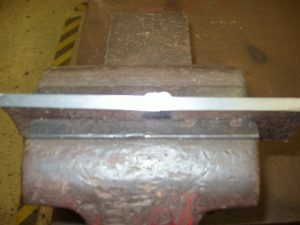 The root bend coupons looking at the face or cap of the weld. Root bend coupons looking at the root weld penetration before removing any excessive weld reinforcement. 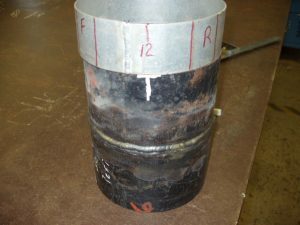 The rest of the pipe is there for an alternate bend test in the case a coupon fails. If a coupon fails it must be within the AWS alternate rules notes. 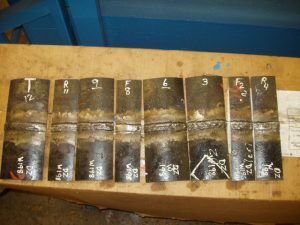 The most common allowed failure is a corner crack that has no evidence of slag inclusions. 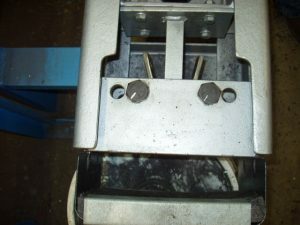 Alternative coupons looking at the face or cap weld. 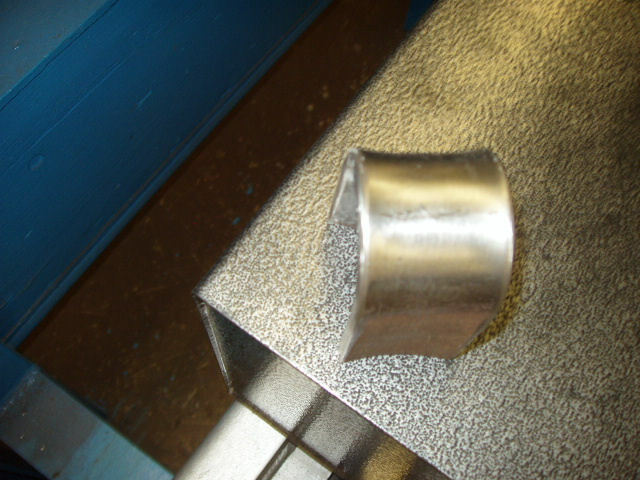 Another view of the alternative bend test coupons from the root weld side. Below are the prepared root and face bend specimens with the weld reinforcement removed by a grinder. 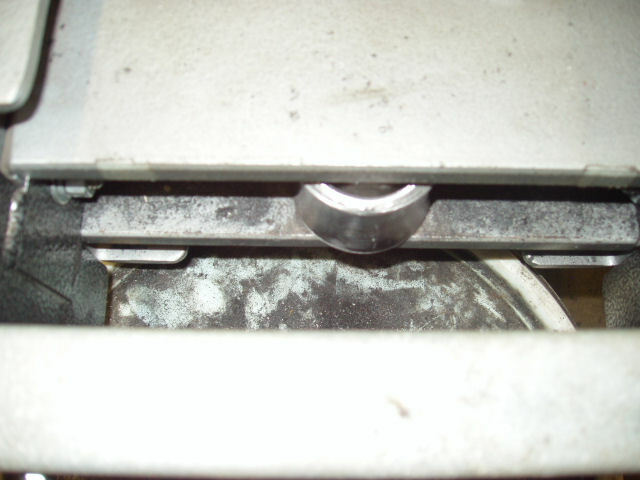 On the inside of the root specimens you can see a little undercut and concavity.The edges of the coupons are also slightly rounded with a sander. This is done to keep the corners from cracking. 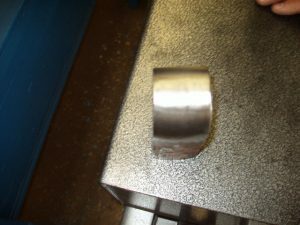 The rules state you can round the edges up to a 1/8 inch radius. Now the root and face test specimens are ready to bend. 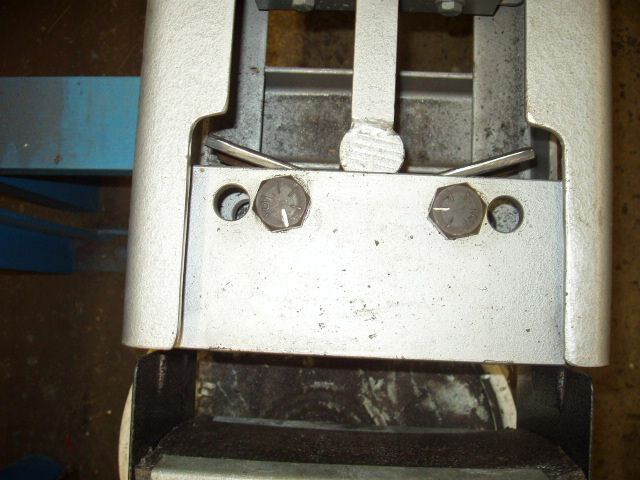 The face bend coupon with the excessive weld reinforcement removed from the cap weld with a grinder. 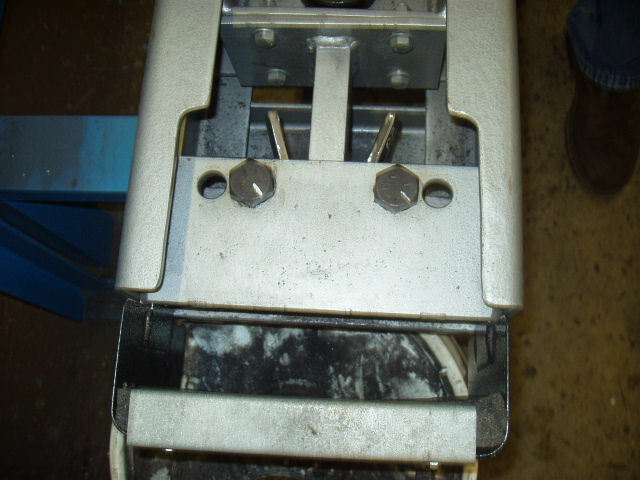 Root view of the face bend coupons after the bend area was cleaned with a grinder. 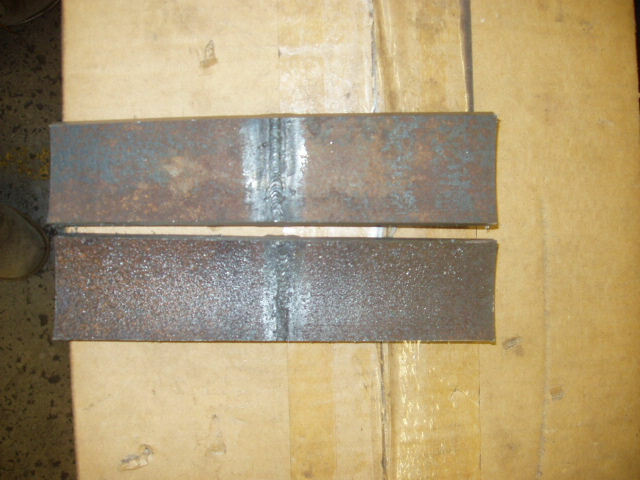 You can see the undercut from the root weld. Root bend coupon with the face reinforcement removed. The root bend coupons with any excessive root reinforcement removed. The bend testing was a nail biting moment. 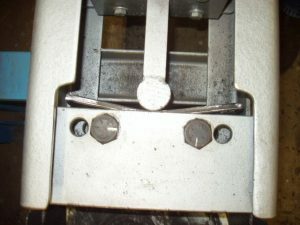 The coupons are put into the bend testing machine and they get bent. 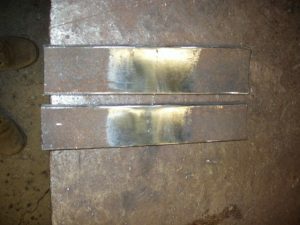 It’s that simple and this is where you really find out how solid your welds are! The pictures below is of my first face bend. This one passed without any problems. 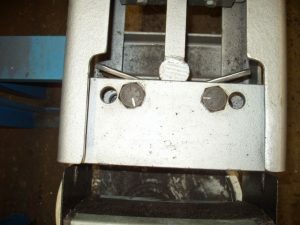 The first face bend coupon is start to bent. 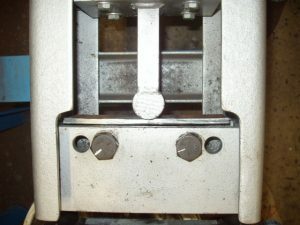 Face bend number 1 is half way through the test and it looks good so far. It looks like the face bend coupon is making the bend. The first face bend coupon looks like it passed the bend test. No defects showing. Here is the second face bend coupon and this one came out fine too. 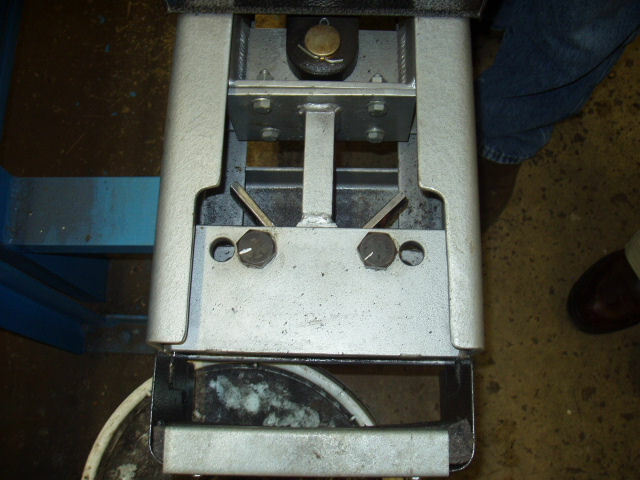 The second face bend coupon is loaded in the bender and the test is started. Half way through the bend test. Almost finished and it looks as god as the first coupon bent. The second face bend coupon looks clean and it very unlikely it can fail. Now the first root bend coupon. It went through and there is a opening in the center of the root. This coupon needs to be examined closely to determine if it is acceptable. At the moment I don’t know if I passed or failed! Starting the second face bend specimen. 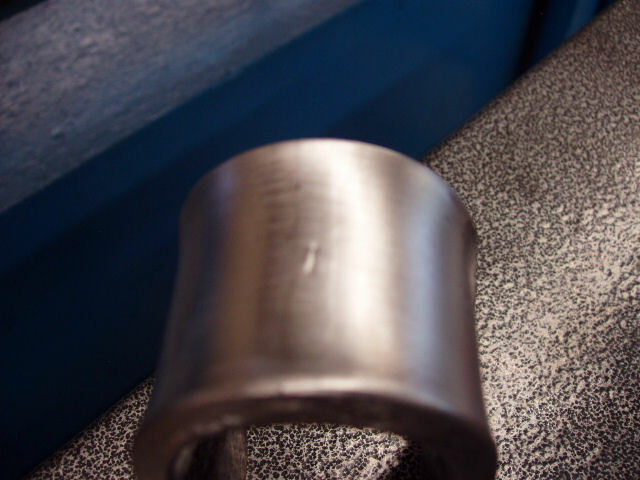 Half way through the bend test and this one also looks good. 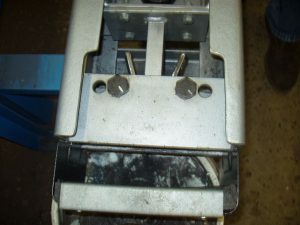 The second face bend looks clean as it is coming out the other side of the bender. The second specimen looks like it passed the face bend test. Now the first root bend coupon. It went through and there is a opening in the center of the root. This coupon needs to be examined closely to determine if it is acceptable. At the moment I don’t know if I passed or failed! 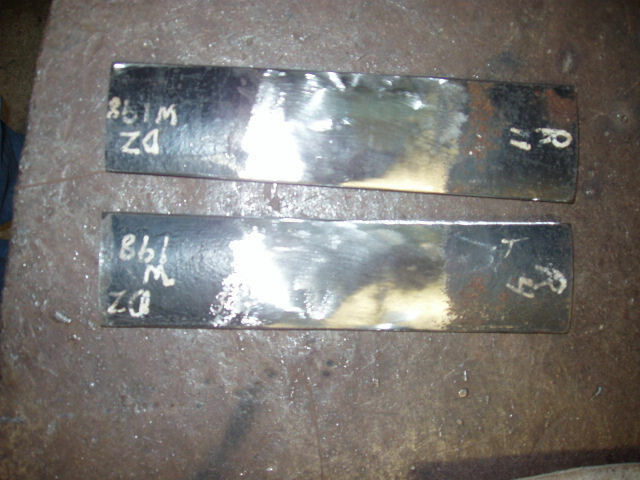 Here are the bend tests. Starting the first of the root bend coupons. Half way through the first root bend coupon. 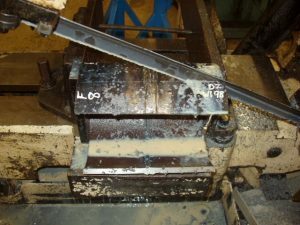 First root bend coupon popping out of the bender. Here is the first root bend coupon. It looks like the concavity of my root is showing and this will need to be measured in detail to make sure it conforms to the AWS B2.1 acceptance criteria. Here is the second root bend coupon being bent. Starting to bend the second root bend coupon. Almost done with the bend test. This root bend looks good so far. This was a nail biting moment. The Certified Welding Instructor/Inspector took the first root bend coupon that had the opening in it and put it under a magnifying glass. 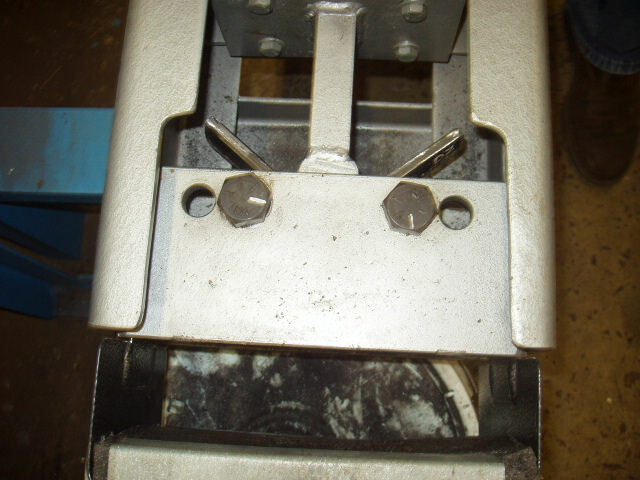 He used a digital micrometer and measured the opening. It came a few thousands of an inch less than the acceptance criteria allows. When taking the pictures I was real nervous. It’s one of those moments you have no control over. This was a nail biting moment. The instructor took the first root bend coupon that had the opening in it and put it under a magnifying glass. 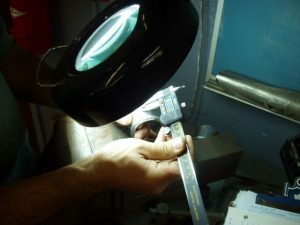 He used a digital micrometer and measured the opening. It came a few thousands of an inch less than the acceptance criteria allows. When taking the picture on the right I was real nervous. It’s one of those moments you have no control over. 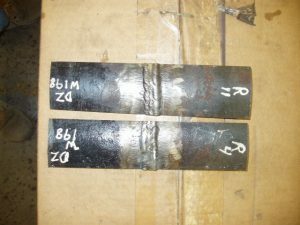 The bend test coupons finally passed the AWS B2.1 Open Root Pipe Welding Certification. There it is! The basics of pipe welding and that is how I passed the AWS B2.1 6G open root pipe welding certification. Since I have taken this welding certification I have been at the Fluor craft welder training center for a long term job interview and an upgrade your welding skills course. 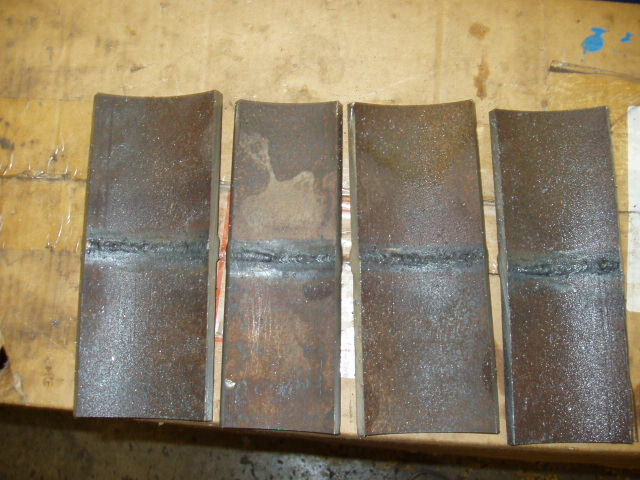 So far I have almost perfected my stick pipe welding since taking this test and am working on my TIG welding skills. 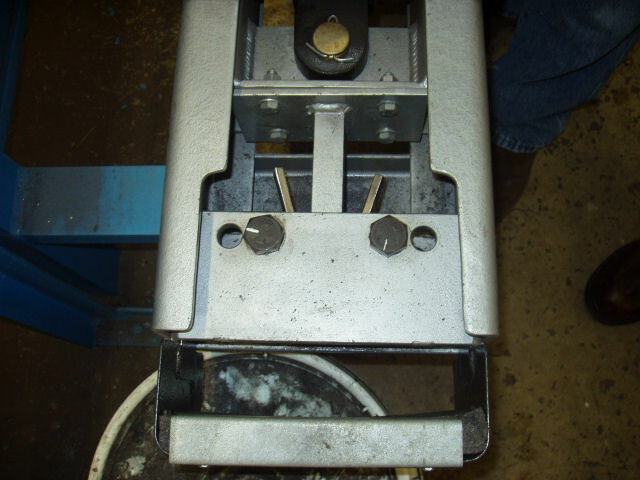 The test they give is a E6010 root with a 1/8 gap and landing, a two stringer fill, and a two to three stringer cap, using a E8018. 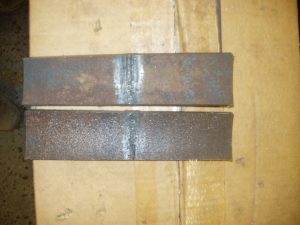 The other main difference is, no grinding allow except on the root. 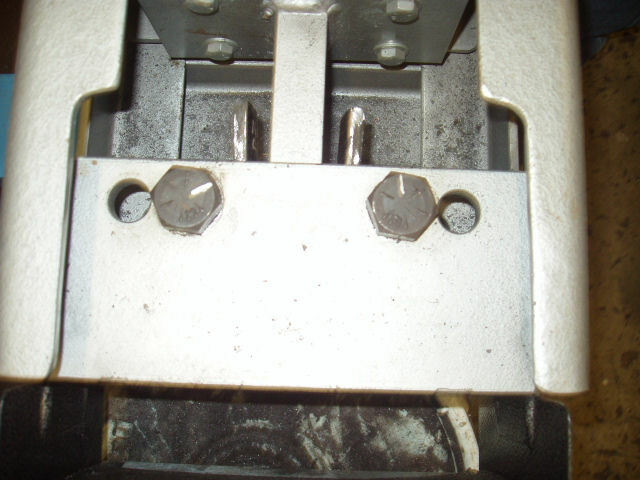 They do not allow any concavity on the root or imperfections on the cap! 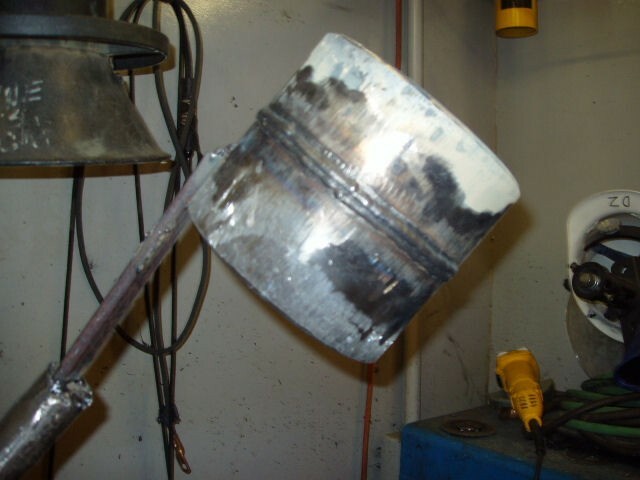 The bottom line is you must weld better then the ASME code allows! 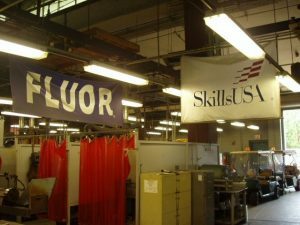 Here are some pictures I took at the training center located at Greenville Tech in SC. My welds have seriously improved with just a little more practice and it is only getting better! This is a great program if you are accepted into it!